Icebergs are commonly found near Antarctica and in the North Atlantic Ocean near Greenland. Icebergs are pieces of ice that formed on land and float in an ocean or lake. Icebergs come in all shapes and sizes, from ice-cube-sized chunks to ice islands the size of a small country. The term "iceberg" refers to chunks of ice larger than 5 meters (16 feet) across. Smaller icebergs, known as bergy bits and growlers, can be especially dangerous for ships because they are harder to spot. The North Atlantic and the cold waters surrounding Antarctica are home to most of the icebergs on Earth. How do icebergs form, and where do they go? Icebergs form when chunks of ice calve, or break off, from glaciers, ice shelves, or a larger iceberg. Icebergs travel with ocean currents, sometimes smashing up against the shore or getting caught in shallow waters. When an iceberg reaches warm waters, the new climate attacks it from all sides. On the iceberg surface, warm air melts snow and ice into pools called melt ponds that can trickle through the iceberg and widen cracks. 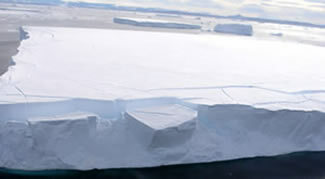 At the same time, warm water laps at the iceberg edges, melting the ice and causing chunks of ice to break off. On the underside, warmer waters melt the iceberg from the bottom up. Icebergs pose a danger to ships traversing the North Atlantic and the waters around Antarctica. 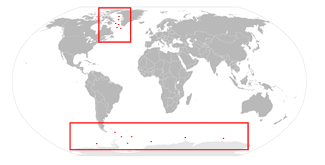 After the Titanic sank near Newfoundland in 1912, the United States and twelve other countries formed the International Ice Patrol to warn ships of icebergs in the North Atlantic. 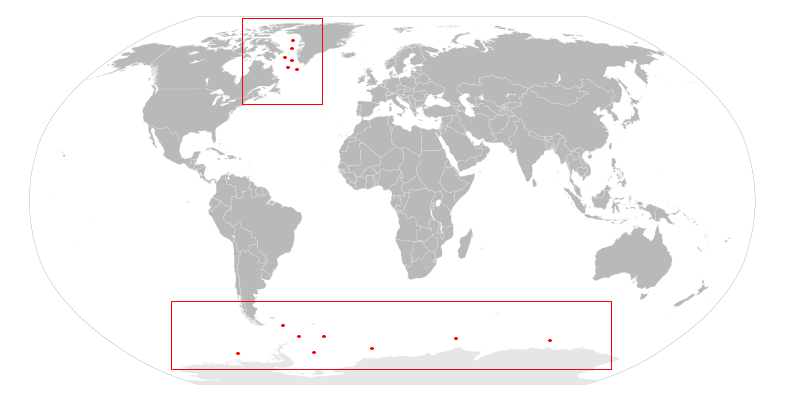 The International Ice Patrol uses airplanes and radars to track icebergs that float into major shipping lanes. 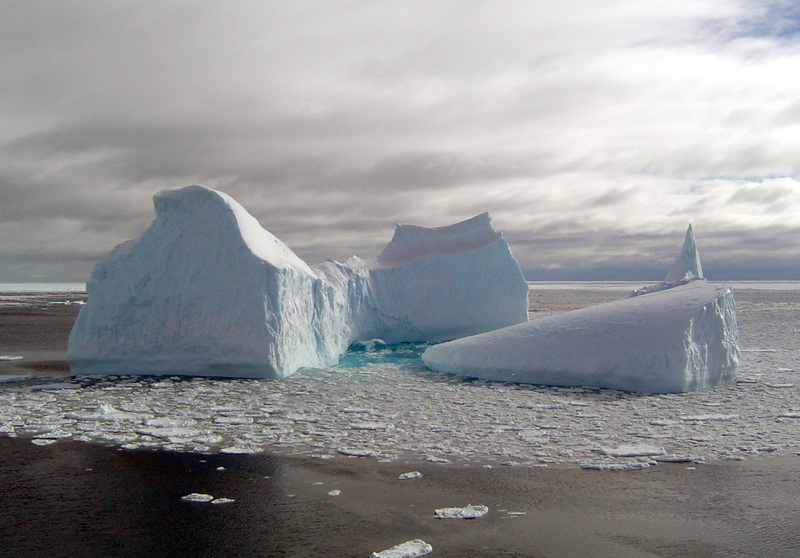 The U.S. National Ice Center uses satellite data to monitor icebergs near Antarctica. However, it only tracks icebergs larger than 500 square meters (5,400 square feet). Climate scientists study icebergs as they break up for clues to the processes that cause ice shelf collapse. Scientists have noticed that the way icebergs break up when they reach warmer waters mirrors the disintegration of Antarctic ice shelves. By studying the factors that cause icebergs to break up, researchers hope to better understand the influences that lead to ice shelf breakup, and to better predict how ice shelves will respond to a warming climate. Oceanographers follow icebergs because the cold freshwater they contribute to the sea can influence currents and ocean circulation far away from their origins. Biologists study icebergs to find out how they influence ocean life. As icebergs melt, they leak nutrients into the ocean around them. Recent studies have shown that the water surrounding icebergs teems with plankton, fish, and other sea life. To learn more about a recent NSIDC study on iceberg breakup, see the IceTrek expedition Web site. IceTrek. 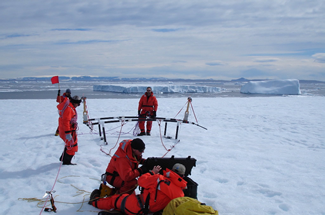 Read about a 2006 research expedition to study the lifecycle of an Antarctic iceberg. International Ice Patrol. Learn more about the history of the International Ice Patrol, the Titanic, and icebergs in the North Atlantic Ocean. Canadian Ice Service. Learn how this agency provides the most timely and accurate information about ice in Canada's navigable waters. U.S. National Ice Center (http://www.natice.noaa.gov). 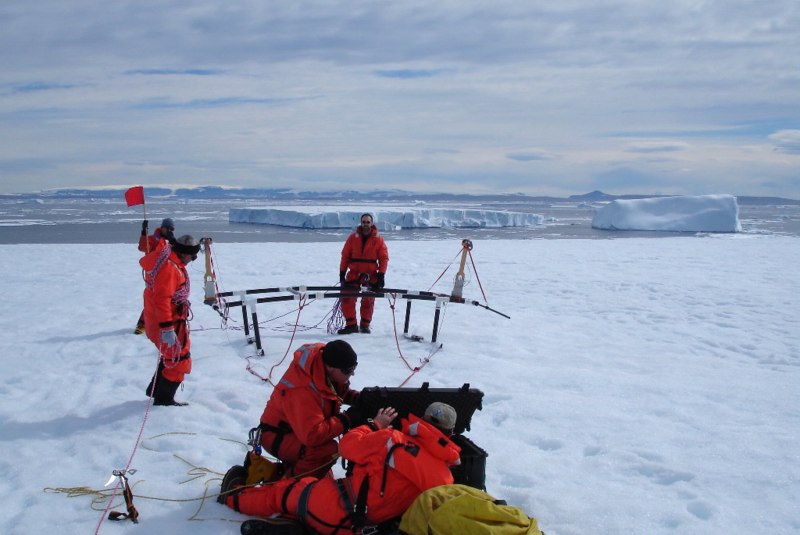 Learn how this agency, a department of the U.S. Navy, monitors icebergs. 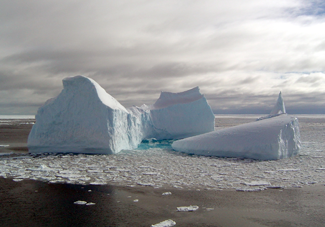 NSIDC distributes scientific data sets related to icebergs. See Advanced Data Search to learn more about our data holdings.